Drilling out a hole in the skull base has to be done with great precision and often takes many hours. It is an intervention that requires the maximum from a surgeon. Researchers from TU/e have therefore developed a surgery robot to take over this task. With sub-millimeter precision, the robot can automatically and safely mill a cavity of the desired shape and dimensions. Jordan Bos will receive his Ph.D. on 16 April for the robot he designed and built. 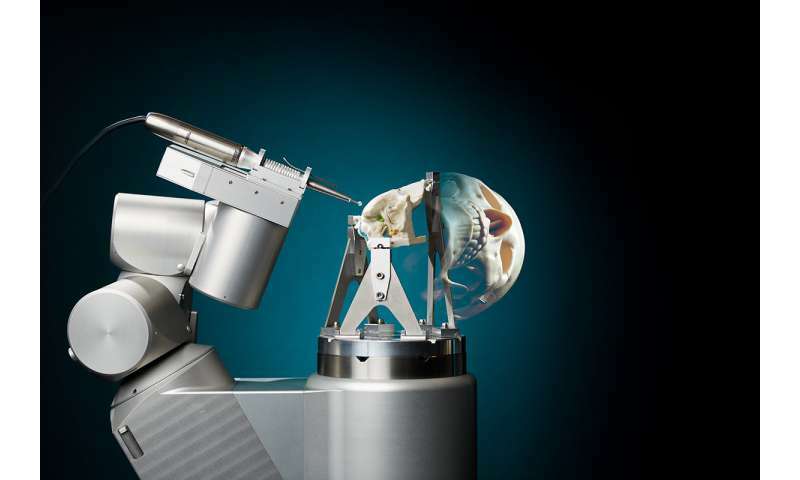 The robot is expected to perform its first surgery within five years. Skull base surgeon Dirk Kunst, who acted as co-supervisor for Bos, is enthusiastic about the robot. "This is an important step towards the operating room of the future. RoBoSculpt is an optimal collaboration between the surgeon and the machine; they really complement each other to achieve the best results for the patient."